-I don’t suffer from insanity, I enjoy every minute of it. Greetings to all our fellow Code Warriors tuning in. Today's narrated broadcasting comes live from the RCA lab as we continue on our quest of unleashing Dr. Colossus upon the world in all his lasery goodness. Recalling out last post, Dr. Colossus's goal in life is to project a laser from its core onto a flat surface in an xy scan. The way we proposed to do so is by actuating two mirrors mounted upon galvanometers. In the purest sense a galvanometer is a type of ammeter that can sense and measure current; however, we take it up a step and use our galvanometers as analog electromechanical transducers that provide a rotary deflection of the mirrors to servo their position. Now, you might ask, "Where are you getting these galvanometers from?" The obvious and thus clearly wrong answer would be to buy them. "Buy them? you say. Sure why not, other than that a single galvanometer serving as a transducer as we want it could cost ~$400, and besides, whats the engineering fun in that. At this juncture in time we were presented with many different options on how to go about acquiring the necessary parts that we needed. The first option was to simply wind our own galvanometers, a simple yet boring task. Being the embedded systems warriors that we (and of course everyone else) are, we chose to get our hands dirty and tear down some stuff to see what could salvage. Sid gave us the suggestion of using the voice coil from an old cd player to serve as the rotary motor that would move the mirrors which we took to heart and built upon. 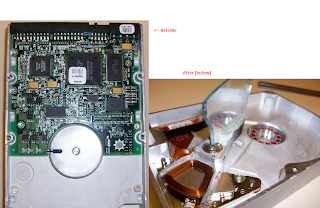 Instead of a cd player, we decided to use an old hard drive and remove that voice coil; we did so because the hard drive has an advantage in that it can be actuated much more quickly than the cd player due a more powerful voice coil. To extract the voice coils for later use, we first were given a few Maxtor hard drives from our good friends over at Penn Commutech. We then removed all fastening screws and front and back cover, exposing the read/write arm of the hard drive and the platters that store data in between. Since we are only interested in the voice coil and how it actuates the read/write arm, we took a punch to the center spindle to knock out the bearing and remove the platters and its central column entirely. After the voice coil was free, we hot glued the mirror that is to be actuated on the axis of the read/write arm. The before and after picture for one of the hard drives is shown below. Thats all folks for this update on the status of Dr. Colossus, more to come.